It's the first Monday of October, the official starting month of fall. And as I glance out my office window at the trees lining the streets, their leaves delicately shifting from summertime lush to autumn-kissed shades of vibrant red and gold, slightly rustling in the early fall breeze, I can almost (almost) block out the sound of my toddler downstairs repeatedly screaming "noooo dadaaaaa" (because she's being told she can't have ice cream for breakfast), the overwhelming number of emails that quickly engulfed my inbox during a long weekend, the baby in my belly who apparently takes pleasure in repeatedly kicking my bladder, and the general disarray that surrounds me in what is admittedly a very disorganized workspace. Often in these moments of chaos I end up feeling overpowered and have to legitimately work to calm myself down. But thanks to what I will from now on affectionately refer to as "Autumn Me Time," a daily break that I am allowing myself to take throughout the season, all I need a tiny reminder (like those sweet fall trees) that relief will be coming this afternoon, and I'm good. Truly good. I've written a couple of posts here in the past about taking time for myself, but I swear I need a reminder with every change of the seasons. Around here, fall means a busier work schedule (holiday madness seriously seems to start earlier every year, doesn't it? ), more indoor play time for my energetic daughter (those easy 'let's go to the park for a couple of hours and let off some steam' days disappear once the cool weather hits), and general transitions into a new season and routine. Last week during a particularly stressful day, I had to physically stop myself for a minute, sit down, and really think about how I could back into the habit of slowing down for at least a few minutes each day to focus on things I enjoy, just for me. My summer me time routine (which involved sitting on my deck in shorts and a tank top, taking delight in the flowers, a summertime beverage, and the other simple pleasures of my favorite time of year) was no longer going to cut it. I just needed to adjust things a bit, to focus on the things about fall that I most enjoy, and to establish a new approach to me time for this season. That evening I headed over to Jewel-Osco, grabbed a shopping basket, and went on a mission. I grabbed a gallon of apple cider, some cinnamon sticks, and the October issues of Real Simple and InStyle magazines. I was prepared. 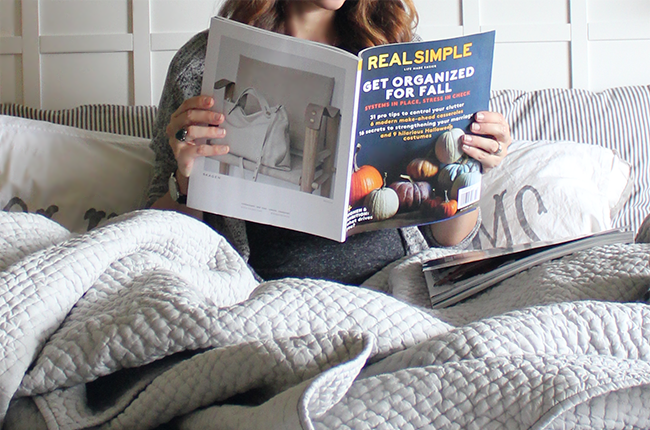 The next day when Essley went down for her nap, I heated up some cider on the stove and poured it into my favorite mug, added a cinnamon stick, lit an autumn spiced candle, and climbed into bed (yep, bed) with my magazines, ready to get inspired by fall fashion, decorating, and other goodness. It only took about twenty (blissful) minutes, and I felt really, really great. I was reminded of the comforts of cooler weather coziness, and instead of feeling overwhelmed by fall's craziness, I felt refreshed and excited about it. 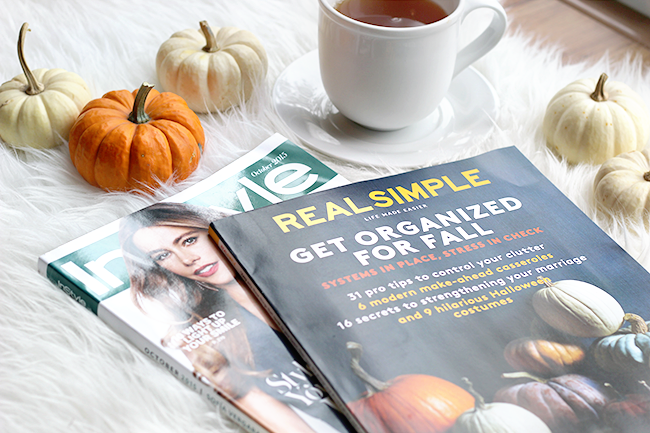 (Thank you Real Simple for your relaxation breathing exercise and fun Halloween decor and DIY costume ideas, and InStyle for your fall accessories guide, fall recipes, and 28 Days of Outfits article!) I told myself that I would continue to take this time for myself - even if just for five minutes - everyday throughout the season. We're all busy. The change of seasons affects all of our schedules. 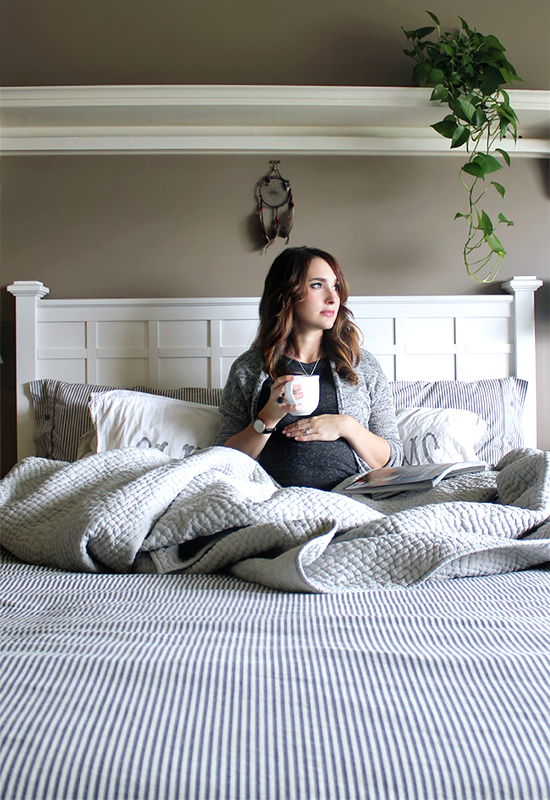 And this is why I wanted to share my little "Me Time" story here, and show how I was able to get back on track with taking time for myself in a way that allows me to appreciate the change of the season instead of letting it get to me. I highly recommend doing the same, you guys. 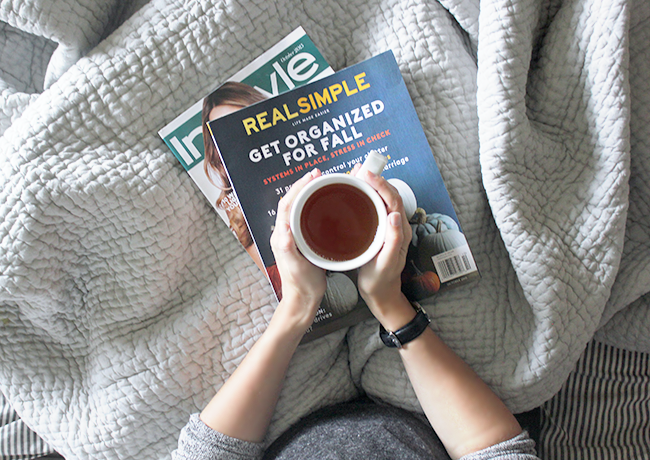 Even if you're not normally a fall person and the end-of-summer transition is rough (this summer girl is waving her hands right now), a few minutes with your favorite hot beverage and a couple of great fall-themed magazines will have you feeling relaxed and all sorts of autumn inspired. Trust me. 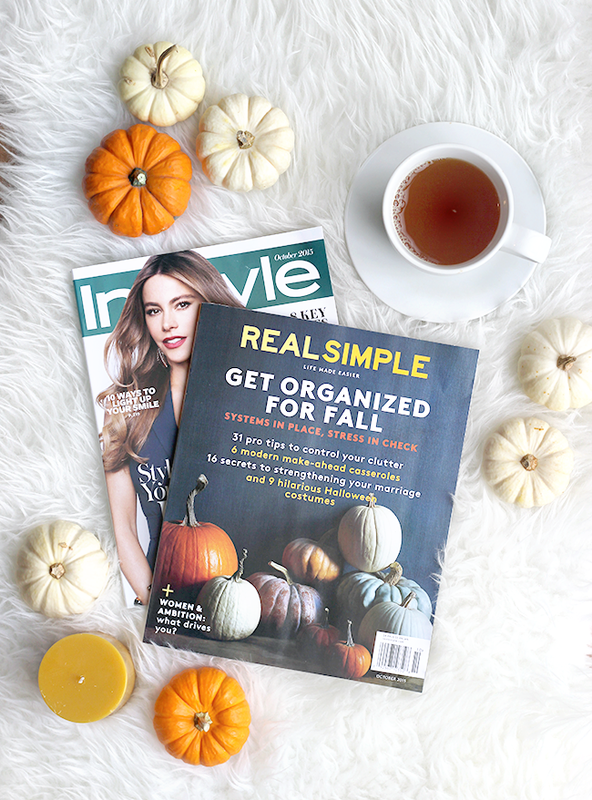 And when you're out grabbing your supplies, take advantage of $1.00 off participating magazine titles (PEOPLE®, InStyle®, People StyleWatch®, Real Simple®, and Sunset®) with this digital offer until 10/18/15 while supplies last. I'll admit it, saving that buck brightened my spirits as well. Does the transition of seasons (especially into busier ones like fall) ever stress you out too? What kind of things to you do to make time for yourself and to enjoy your favorite things about autumn? This post is part of a social shopper marketing insight campaign with Pollinate Media Group® and InStyle® and Real Simple® Magazines, but all my opinions are my own. #pmedia #BacktoMeTime http://my-disclosur.es/OBsstV. Thank you for supporting Bubby and Bean by allowing me to post occasional sponsored content. You're right about the need to adjust to the seasons. Taking me time is so important too, this makes me want to spend a few minutes after work curled up with a good magazine and some hot chocolate! These photos are so inspiring. I need to do exactly this! 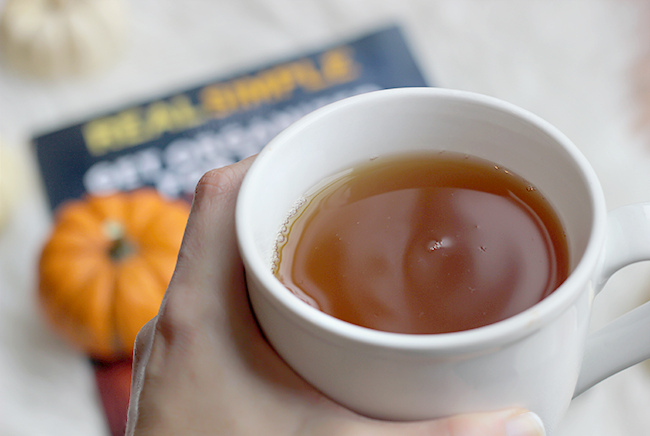 Autumn is my favorite season, and it seems natural to cozy up with some hot herbal tea and a good read. Good for you for taking the time to regenerate yourself with some me-time away from family obligations and life's general pandemonium. This is especially important as the calendar approaches the holidays! Just reading your post made me calmer :) Your Me Time sounds awesome! I try to find one night each week to take a long, hot bath. A glass of wine and a magazine help take my mind off everything else. Although I've been keeping track on IG, I don't think I've visited the blog here since you're big announcement that Essley will be a big sis! Gosh, typing that just made my jaw drop. I'm so glad I could visit today and learn about your ME time. Thanks so much for your comments everybody! Yay for me time! That bed looks ridiculously comfy!!! !